The Pitman Arm Master Service Kit is designed to easily remove many of the most common styles and even the most stubborn pitman arms including the Sheppard M100 style Gear Box. It will work on intermediate to heady duty trucks. It eliminates dangerous hammering and cutting torch methods. Made of high strength steel casting designed for high capacity pulling. 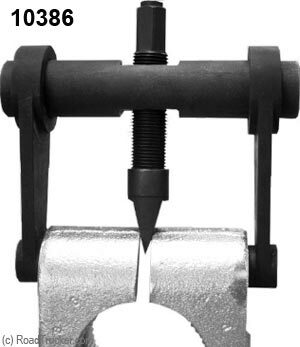 10385 Sheppard M100 Pitman Arm Puller - may be used with up to a 1/2″ impact tool. 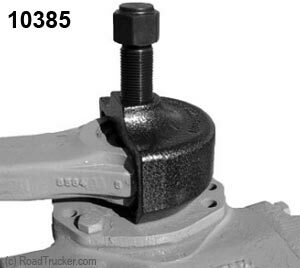 10386 Pitman Arm Spreader - safely and efficiently remove pitman arms on 2-ton and larger trucks. 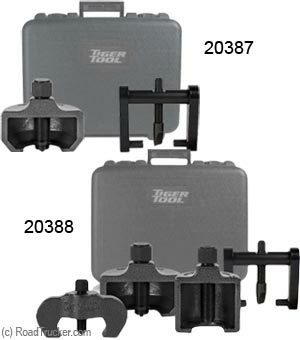 Can be used with a 1/2″ impact tool. 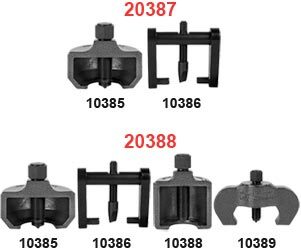 10388 Intermediate Pitman Arm Puller - works on intermediate trucks, school buses, and other vehicles with a nut release pitman arm. May be used with up to a 1/2″ impact wrench. 10389 Sheppard M110 Pitman Arm Puller - easily remove the pitman arms on Sheppard M110 gear boxes. May be used with up to a 3/4″ impact tool.